Last week a convoy of some 40 trucks loaded with military equipment was ambushed and destroyed (pics, vid). It was the largest such incident since the Soviets left Afghanistan. 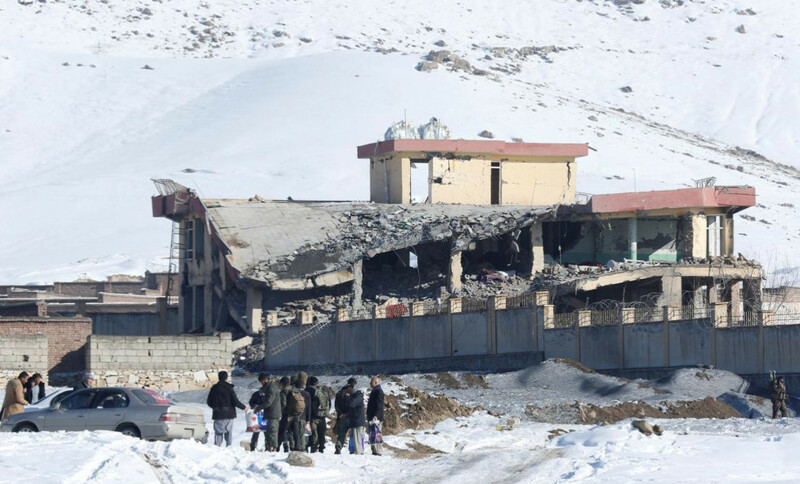 Also last week a large bomb hit a security compound within the fortified international quarter of Kabul. At least five people died and some hundred were injured. On Sunday a car bomb hit the convoy of the governor of Logar province. Eight of his body guards died in the attack. Earlier today a raid on a military training center for the National Security Directorate, the Afghan CIA offshoot, killed some 200 forces. The attacking rebels used a U.S. made armored Humvee to drive into the compound and exploded it. A infantry unit followed and shot up the survivors. Many successful raids on outlying security posts and police checkpoints are no longer mentioned in western media. The Afghan government has stopped providing casualty numbers. Neither winning the war nor negotiating a lasting peace is a real option in Afghanistan. Just leaving, though, as we are about to do in Syria, would be a mistake. What we need is an open-ended, affordable strategy for not losing. What please is a strategy of not losing? Especially when the situation on the ground has for years been getting worse despite several large U.S. surges. The Soviet war in Afghanistan lasted nine years. But it was largely successful in building a stable government and the Soviets left a mostly competent Afghan military behind. Three years later Russia ended its financial support for the Afghan government. Only that gave the guerrilla the chance to destroy the state. After 18 years in Afghanistan the U.S. military seems still unable to create and train competent local forces. Aviation experts have criticized a decision to phase out the old workhorses of the Afghan forces — Russian-made Mi-17 helicopters — for American-made UH-60 Black Hawks. Why the U.S. military, which since Vietnam proved inept at fighting local guerrillas, believed that its ways of fighting suits an Afghan force is inexplicable. If the Taliban manages to win without an airforce why should the Afghan military need one? A survivor of the attack carried out in Surkai village in Zurmat district, in Paktia province, described to AAN how five men in his family, including three university students, and a neighbour, were summarily executed and how he was questioned by an American in uniform accompanying the Afghan gunmen. The Paktia governor’s spokesman has also confirmed that ‘foreign troops’ were involved in the operation (and the US military spokesman has said the US military was not involved). Those abuses are actively pushing people toward the Taliban, the officials say. This conflict between militarized CIA proxy forces and forces trained by the U.S. military played out in every recent war the U.S. waged. In Iraq CIA sponsored Shia units clashed with Pentagon sponsored Sunni militia. In Syria CIA trained 'rebels' ended up shooting at U.S. military trained 'rebels' and vice versa. In Afghanistan the rogue force under CIA control is some 3,000 to 10,000 strong. It largely alienates the same population the Afghan military tries to protect. Unity of command is an important condition for successful military campaigns. As the military works in one direction while the CIA pulls in another one, the campaign in Afghanistan continues to fail. A similar split can be seen in Afghanistan's political field. The CIA is notorious for bribing Afghan politicians, while the military launches anti-corruption campaigns. The political system installed by such competing forces is unsustainable. The last Afghan election with the top candidates being the Pashto Ashraf Ghani and the Tajik Abdullah Abdullah, was marred by irregularities. The uncertain outcome led the U.S. to fudge the results by making Ghani president and Abudullah his 'chief executive'. Both are now again competing against each other in the elections that are to be held later this year. They will be as irregular as all elections in Afghanistan are. The disputed outcome might well lead to new clashes between ethnic groups. This upcoming conflict will further weaken the Afghan state. Why hasn't anything been done to prevent it?